The recent creation of a comprehensive united structure to unite Russia’s territorially far-flung Cossack ‘hosts’ or communities is a continuation of Russian Vladimir Putin’s corporatist societal management strategy. Although the new Russia-wide Cossack Host or simply Cossack Host of Russia (Vserossiskoe kazach’e voisko) or VKV is also a structure of cultural autonomy that will help Cossacks preserve and develop their unique culture in the Russian context (Cossacks are widespread in Ukraine), it is also a mechanism of political control and feedback for Moscow — in other words, a corporatist structure. The VKV’s creation mirrors several other corporatist structures established by Putin, including the Russia-wide Ulema Council created last year. With the VKV’s formation along with the recent formation of a united vertical structure for Muslims, Putin’s Russia has taken on even more than previously the look of a regime and system similar to the pre-democratization Mexican corporatist system under the PRI circa pre-1990s. The VKV, founded at a constituent assembly of the Russia-wide Cossack Society (VKO) in December, will create a single, hierarchical structure for state management, organization, and some self-management within confines determined by the Kremlin for Russia’s 200,000 register Cossacks. 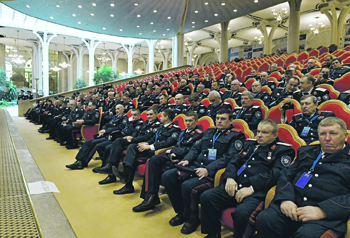 The VKO constituent assembly of 570 delegates decided to unite all registered Cossacks and Cossack communities under the VKO and VKV (www.ng.ru/ng_religii/2018-12-04/9_455_cossack.html). Cossacks can be regarded as an ethnic group separate from the Russian or Ukrainian nationalities, having their own self-identity and culture but lacking a specific Cossack language. Along with their families the Russian-wide Cossack community numbers some 7 million. This establishes it as large as Russia’s largest non-Russian nationality, the Tatars, making the Cossacks a potentially powerful political force. Its historical ties and loyalty to the Russian state make it a powerful ally of the majority Russian nationality. Cossacks are universally Orthodox Christian, the December assembly was held in Moscow’s Church of Christ the Savior. The Cossacks and its VKV are unlikely to represent a liberal opposition force; to the contrary, it tends to be a nationalist or ultra-nationalist traditionalist force demanding more, rather less traditional Russian politics, though key elements sided with the February 1917 revolutionaries. The Cossacks represent a militarized caste in addition to a semi-ethnic group. During the Imperial era, they were deployed along Russia’s border essentially as border troops. There is a strong element of cultural autonomy in the VKO and VKV, but the VKV marks a distinct step in the direction of corporatism in support of a vertically integrated administrative structure managing Cossack civilian and military life. The new VKV will be headed by a ‘mandated chief’ (nakaznyi ataman) or top hetman will be appointed by the Russian president much as the Cossack hetman was chosen by the Emperor in Imperial Russia beginning in the 18th century with the crushing of the Cossack Hetmanate’s autonomy. 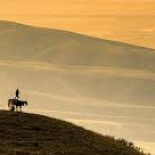 A Central Staff will consist of 43 hetmen, who head Russia’s various Cossack communities extending across the country and 11 departments administering educational, military, cultural and other activities for the 11 Cossack regional communities in Russia (e.g., Kuban, Don, Terek, Ural, Siberian, Far East, etc.). The VKV will have its own representative organ, a Council of hetman, as well as a board, consultative organs and a supervisory accounting commission. The weight of the structure and function of the VKO and VKV appears on the side of state corporatism, driven top down, rather than societal corporatism, driven bottom up, the latter which would be closer to a purer cultural autonomy model. The state-driven nature of the VKV is reflected in the development of Cossackdom in Russia’s southern border region in the North Caucasus, Krasnodar Krai. The leading candidate to head the VKV is Kuban Cossack Host’s (KVK) ataman, Nikolai Doluda, the deputy governor of Krasnodar Krai. Dodula is also the chairman of the Council of Hetman of Registered Cossack Hosts, which coordinates Cossack affairs with the Russian Presidential Administration, the Federal Agency of Nationalities Affairs and the Synod Committee of the Moscow Orthodox Church Patriarchate. Thus, Doluda represents the integration of Cossack and state structures. In Krasnodar, 27 of the 56 hetmen are heads or deputy heads of local municipalities. Cossacks patrol the streets along with police in the region, a development driven in part by the rise of jihadi terrorism in the nearby North Caucasus Muslim-dominated republics of Dagestan, Chechnya, Ingushetiya, Kabardino-Balkariya, and Karachaevo-Cherkessiya. They have also conducted inspections of Krasnodar school children’s computers searching for inappropriate materials. There is a Cossack educational system embedded or parallel to the state system in Krasnodar at both the primary and middle school levels, with Cossack classes in state primary schools and separate Cossack middle schools. In rural communities, many state schools are run on the model of the Cossack schools, and in some Orthodox priests run classes, which violates the Russian constitution’s separation of Church and state. Many Krasnodar officials refer to the non-Muslim nationalities in Krasnodar as Cossacks, not Russians. The Russian government official in charge of Cossack affairs said the new VKV will manage Cossack communities on the Krasnodar and Rostov regions’ models, though the latter does not resemble the former’s state integrative model (www.ng.ru/ng_religii/2018-12-04/9_455_cossack.html). Will the VKV attempt to Cossackize rural schools across Russia’s Cossack communities, some of which in Rostov have adopted the Krasnodar schools’ model? Will Doluda, who chaired and whose 120 Kuban delegates dominated the December constituent assembly in Moscow, be appointed VKV nakaznyi ataman? If so, the Kuban model could spread to Rostov and effect other Russian regions with large Cossack hosts. An indication that Russian Cossackdom will undergo not just integration but also uniformity is the plan to merge the newspapers of the 11 Cossack hosts into a single VKV newspaper. There are several other potential and actual implications of the KVK’s formation. First, Russia’s development of a state corporatist model as part of Putin’s soft authoritarian hybrid regime has been extended. If corporatism can be defined as a element of governance utilizing vertically integrated institutions to organize classes, profession or other groups with unique characteristics, social or economic functions in order to connect them to state administrative structures, then the VKV marks another step in a corporatist direction. In addition to numerous other structures, such as state-tied trade unions and the Academy of Sciences, Moscow managed last year to create a united structure, the Russia-wide Ulema Council, to coordinate Russia’s several Russian Islamic umbrella groups and manage Islamic theology and education after years of failed attempts to do so (https://gordonhahn.com/2016/12/01/the-all-russian-ulema-council-a-step-towards-a-unified-rossiiskyi-islam/). Thus, the Russian governmental ‘sistema’ begins to appear more and more like Mexico’s pre-democratization, single-party dominant corporatist system, with separate structures for labor, business and so on tied to the then ruling Revolutionary-Institutional Party (PRI), which ruled Mexico for most of the 20th century after its 1910-1920 revolution. Like the PRI single-party system, Russia’s also includes several small political parties, which are allowed to win offices but are restricted to minority status. Second, by uniting the Cossacks in a single structure, VKV’s creation strengthens, indeed institutionalizes Cossacks as a nationality and promotes with the pecking order of Russian nationalities. Already prior to the new institutionalization, informal status put the Cossacks in good stead. The head of Russia’s Federal Agency of Nationality Affairs, Igor Barinov, is a Kuban Cossack, a member of the VKO and runs the Russian government’s work with Cossack communities. Head of Russia’s Investigative Commission Aleksandr Bystritskii and Russia’s Prosecutor General Yurii Chaika are both Kuban Cossacks. Third, the rise of the Kuban Cossack Host raises Krasnodar Krai in the pecking order of Russia’s regions, making it a challenger to Ramzan Kadyrov’s Republic of Chechnya as the ‘great power’ in southern Russia. If we were to see the kind of revolution, state meltdown and civil war in Russia that we witnessed in Ukraine during and after the Maidan in which the Ukrainian nationalist began to prepare to secede from Ukraine when eventually overthrown President Viktor Yanukovych was able to resist the early, less violent Maidan protests, we might see a similar Krasnodar nationalist separatism invoked and Cossack troops used to protect the regime ruling group or, if it were defeated, push forward an alternative to any liberal or leftist takeover of power. Fourth, the rise of Cossackdom could become an important resource that Russia’s already powerful siloviki would be able to wield through either Bystritskii or Chaika or their possible subordination to a siloviki institution such as the Russian Guard (Rosgvardiya). Fifth, the rise of Cossackdom in Russian politics could influence its foreign policy. That is, the rise of Cossackdom in Russia and of the Kuban Cossacks in the south along Russia’s border with Ukraine is both a consequence of, and has implications for Russian-Ukrainian relations and the civil war in Donbass. The Kremln’s intensified focus on Cossack affairs and the Cossacks’ willingness to unite in a single structure are a response to the February 2014 Maidan revolt and rise of the oligarchic-ultranationalist regime in Kiev. Their April 2014 declaration of an ‘anti-terrorist operation’ in Donbass, home of the Don Cossacks, without attempting any serious negotiations with the Donbass rebels. There was little momentum to unite Russia’s Cossacks prior to those events. The first united constituent assembly of the KVO was only held in February of this year. December’s assembly convened on the background of Ukrainian President Petro Poroshenko’s and the Constantinople Orthodox Church’s attempt to run the Russian Orthodox Church (ROC) out of Ukraine by uniting all Orthodox churches and parishes in Ukraine under a new Ukrainian Orthodox Church (UOC), with a clash imminent over souls, Church buildings, monasteries, and other property set to ensue once the Ukrainian government begins to enforce the handover of property to the new UOC. Neither the Kremlin nor Russia’s Cossacks will take kindly to the likely violence. In October, Russia’s Cossack hosts, first of all the Kuban Cossacks, supported the ROC’s decision to break eucharistic relations with the Constantinople Patriarchate. Thus, Russia’s Cossacks will be the first volunteers and recruits to flood Donbass should the religious conflict reignite the Donbass civil war or spark civil war in other Ukraine border regions. In addition, during any ‘color revolution’ in Russia, the Cossacks could be deployed or deploy spontaneously to put down any liberal or leftists takeover. May God bless these positive developments! From 'Not Us' to 'Why Hide It': How Maidan Denied Its Involvement in the 20 February 2014 Snipers Massacre and Then Admitted It?